"Robust Tracking of Robot Manipulators via Momentum-based Disturbance Observer and Passivity-based Controller"
Abstract : "The passivity-based controller is one of most widely-used controllers for robot manipulators. Since it strongly exploits the system properties, it does not produce unnecessarily large control effort and has inherent robustness against plant uncertainty and disturbance. This paper presents an inner-loop controller which can enhance the robustness of the passivity-based tracking controllers. The inner-loop controller developed in this paper robustly estimates the lumped disturbance, which is defined by the effect of plant uncertainty and external disturbance, and generates a compensating signal so that the closed-loop system consisting of the uncertain robot, disturbance observer, and passivity-based controller behaves like the nominal closed-loop system composed of the nominal model of the robot and the passivity-based controller. 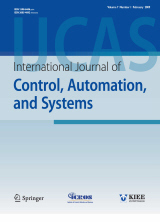 It is seen that the tracking error can be made arbitrarily small by choosing the controller parameters appropriately and the performance of the proposed controller is validated through numerical simulations." Keyword : Momentum-based disturbance observer, passivity-based controller, robot manipulators, robust control.